Impact-resistant housing design protects against shock and vibration – Plastic + steel. This model is equipped with a vibration alarm. Very powerful LED backlight provides illumination of the dial. When you angle the watch towards the person to read the data, the function automatically, and provides coverage of the dial. 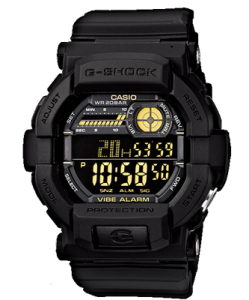 The main objective was to create a Casio watch, which can not be destroyed. In the name of “Triple Ten” first watches Casio G-Shock was designed: to survive 10 years, have a water pressure resistance 10 ATM (most models have already been 20 ATM) and survive drops from a height of 10 meters.